In June 2013 I had the great pleasure to meet Derek Fenton, the younger brother of Bob Fenton, the sole survivor from cousin Jim Ives’ aircraft ND360. Derek told me how the loss of his crew-mates and his own survival had deeply affected his brother Bob. I had managed to make contact with Bob himself early on in my research, at which time he was suffering with ill health, even so, he kindly recounted what had happened when their Lancaster had been attacked on their bombing run into Berlin by a German night-fighter. As detailed in ‘Does Life Hold Any More in Store?’ another account of the loss of ND360 came to me via 100 Squadron veterans Douglas Hudson and Terry Cook. Last year a fresh account came to me, by a somewhat circuitous route, with a satisfying connection to 625 Squadron. 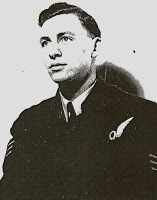 Iain Sutton, son of Reg Price’s rear gunner Francis (Frank) Sutton, has business premises close by Alan Cornes’ home, Alan being the younger brother of Jim Ives’ flight engineer – Sgt Denis Cornes – quite a coincidence! The account is the most detailed of Bob’s three accounts as it was told so soon after the traumatic event. 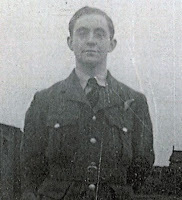 Bob had been incarcerated as a prisoner-of-war and had suffered the cruelty of the ‘run up the road’ incident and had survived where his crew-mates had not. I Trust that you will excuse me for not having written to you sooner, but let me now send my deepest sympathy in your sad loss. I can only say that it was a great privilege to fly alongside your son Dennis, always one of the best of fellows. I can assure you that there was no suffering for any of my crew as everything took place over Berlin in a matter of seconds. There is an old saying with us RAF boys that “the good die young”, and I believe in that now. Although I have had a partial lapse in memory, I can remember certain details of 30th Jan ’44 enough to be able to tell you that the action took place over the north-west district of Berlin after an attack from a fighter. I shall be returning to New Zealand about the end of August, but before I go I shall be hoping to hear from you. I only wish that I could have met you all, but time does not permit me. Before I return I am to be married to a Scottish girl, whom I became engaged to last week. On the other hand, if my repatriation to NZ is delayed in any way I shall do my utmost to visit you. I have a full list now of the crews’ people if you would like a copy of it, just let me know! I wrote to Dennis’ girl in the WAAFs, but so far have had no answer. If you have her present address at her home I would appreciate it very much. I hope you will excuse this short letter, but then again I hope I shall be able to see you later. Thanks for your reply to my letter, and I shall do my best to answer fully all you have asked for. The first indication any of us had of our danger that night was when the fighter fired at us. Apparently the gunners were caught unawares & usually the period of a fighter attack is no more than five seconds. I heard our wireless operator Don Savage, call out that we were hit, & as there was no word from the gunners, I gave immediate evasive action to the Pilot, but our controls must have been shot clean away as the plane just went into a tight spin. 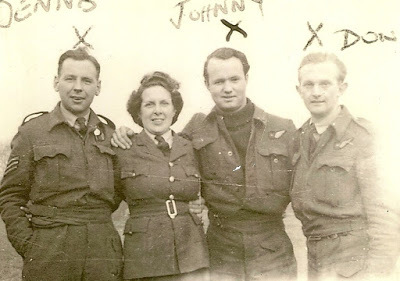 At this stage no-one had their parachutes on to my knowledge; the Pilot gave us orders to abandon the aircraft, and in a matter of seconds I had my chute on & had also jettisoned all of the bombs. I was then thrown out of the aircraft, right through the nose, & the last thing I remember was Dennis right behind me. I think he had his chute on, but I don’t think he could have made it in time. I did not even see the plane after I came to, & I had no information given from the Germans to rely on. I landed in the centre of the city of Berlin & was taken prisoner immediately. I ‘passed out’ twice before I left the aircraft & I can only surmise that the rest of the crew lost consciousness in the spin. When I left the aircraft we must have been up at 12 or 15 thousand feet. I feel sure that you will hear later from the War Office as to where the boys are buried. I shall have to close this letter now, but I shall write again later.